Choose something (almost) sensible from $55 per day or less. 4 doors. 4 seats. A decent sized boot. A fixed roof that doesn’t move. Italian engines that definitely do move the rest of the car in quite a pleasing, planted way. What are we thinking? A saloon car that seats 4 adults and a decent amount of luggage? Have we gone all sensible and middle aged? Well yes….and no. For those who prefer to proceed in a fashion no less briskly and entertaining than the rest of our fleet but a lot more discreetly with a lot more space, this is the car for you. It’s Alfa red paintwork and sharp suited styling signal some intent. At first glance it looks like a coupe but then you notice the outline of the rear doors and the hidden recessed door handles. So it’s another 4 seater rental saloon then, ho, hum. But we don’t do ordinary at RentAClassic. You’ll note the automatic transmission also has a ‘H gate’ icon revealing you can change gears yourself if you want without needing a clutch. Getting interesting but so what? Well there’s also a tiny little button nearby marked “C/S”. “C” stands for city mode which keeps things economical, changing gear around 3000 rpm. “S” however equals sports mode which holds the gears for quite a bit longer, allowing those big fat shiny inlets under the bonnet to work things up to a howl and allowing you to proceed with a fair bit of due progress….up to legal speed limits of course. Really good. Everything works as it should and it’s very smartly presented inside and out. The boot can swallow a lot, including a full size solid suitcase and lots of bags, with a fold down cubby hatch in the central rear armrest for some skis or a very skinny Christmas tree, (you’re clearing up the needles though). Plus if you’re only two up there’s a lot of extra space on the back seats. For exact dimensions, refer to the Seating & Luggage tab above. 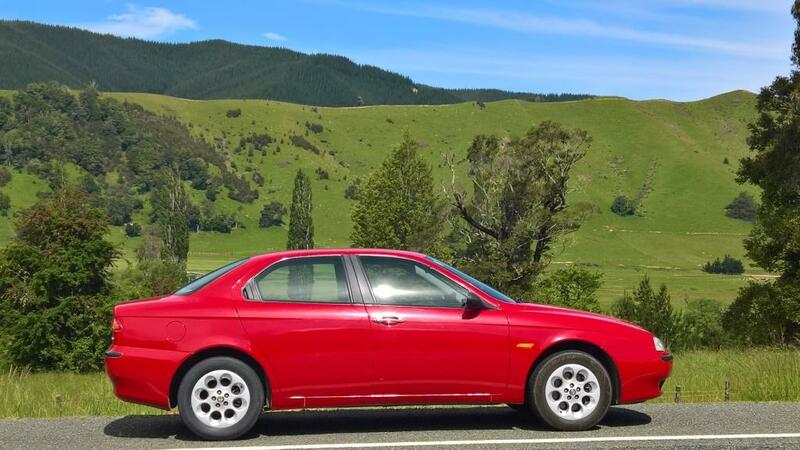 And the RentAClassic description for the Alfa Romeo 156 V6 Saloon?